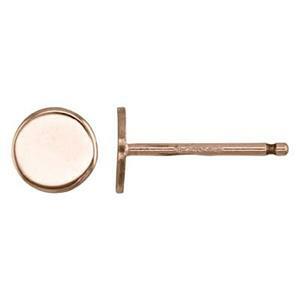 14/20 Rose Gold-filled 4.1mm 24 gauge Tiny Circle Stud Earrings, .7mm Post Thickness, Clutches Not Included. Order 2pcs to get one pair of earrings. Postpositive! Whether you’re here to make jewelry creative – or to make creative jewelry – it’s all Postpositive! These little 14/20 Rose Gold Filled 24 gauge Tiny Circle Stud Earrings with a .7mm Post, look just like a little piece of confetti, or an individual sprinkle from a party cupcake. Sell them as part of a creative earring suite or use them in combination with trendy jacket findings. Little simple spangles when your current life’s outing requires uncomplicated attire or attire uncomplicated.